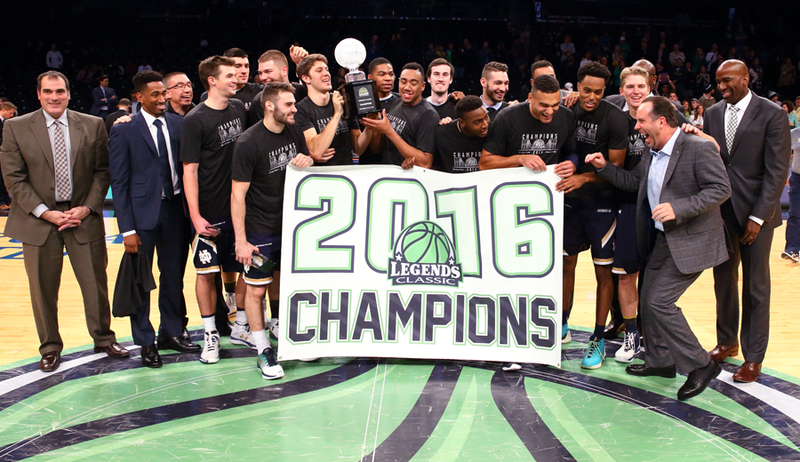 PRINCETON, N,J./BROOKLYN, N.Y. – Matt Farrell and Steve Vasturia scored 18 points apiece to lead Notre Dame to a 70-66 win over Northwestern to claim the 10th annual Legends Classic championship. The Irish led by as many as 12 points, 48-36, with 18:01 to go in the game before Northwestern fought back to take a 61-58 lead on a Nathan Taphorn 3-pointer with 6:44 to play. The Wildcats increased their lead to six, 64-58 when Bryant McIntosh drained a 3-pointer with 6:16 to go. Then Notre Dame took over. The Irish scored 12 of the game’s final 14 points, taking the lead for good on Matt Farrell’s layup with 14 seconds to go, making it 67-66. Bonzie Colson scored 13 points and had 11 rebounds for Notre Dame, which also received 11 points from V.J. Beachem. Farrell was named the tournament’s Most Outstanding Player while Vasturia earned all-tournament honors. Scottie Lindsay led Northwestern with 18 points while Vic Law tallied 14 points and seven rebounds. Both garnered all-tournament team honors. In the consolation game, Derrick White had 16 points to lead Colorado to a 68-54 win over No. 23 Texas. For his efforts, White was named to the all-tournament squad. George King had 12 points and 13 rebounds and Josh Fortune netted 11 points. Kerwin Roach Jr. and Jarrett Allen had 16 and 15 points respectively, for Texas.